Should you consider adding first down scoring to your leagues? We break the system down. The fantasy “off-season” is officially upon us now. Hopefully, this means you have already let your league commissioners know your intentions for the 2019 fantasy season. You’ve already made certain your roster is in compliance with your off-season rules, and you know if there are any deadlines approaching for league fee payments, roster changes, etc. If not, you better stop reading and go figure that out. Don’t worry, I’ll wait for you. All good now? Okay, let’s get back to it. Now that is all dealt with, it is time to move on to your next task. Unfortunately, it is something that many league owners just don’t participate in at all. It is time to start proposing changes to your league rules and bylaws. Having a league with well-constructed and thought our bylaws to go with a fair scoring system is one of the key factors in if a league will last for years to come or if it will quickly circle the drain and break up. Much like the NFL, leagues need to change and evolve with the times. Every league should be going through an annual evaluation period of its rules where owners can have open and honest discussions about the things that work and the things that need to be changed. What was great ten years ago when your league started might be an area of concern today. 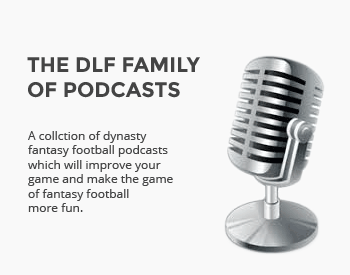 When I first started writing for DLF almost six years ago, one of my big pushes was to “Kick the Kicker” from dynasty leagues. It took a while, but I think playing without a kicker in dynasty is now the norm. This is just one example of a change that leagues can and should be making as time goes on. In order to help you out, I have decided to put together a little series with a few ideas for changes you should be proposing and discussing in your leagues. Before I go any further, let me be the first to say that every league is different, and it is important that you do what fits your league and what your owners find enjoyable. If you don’t like an idea or it doesn’t fit with your league’s philosophy, then, by all means, don’t bring it up. These are just some ideas I think are definitely worthy of discussion. I understand your frustration with scoring, as a big play idp euthanist I dont mind the concept of first down scoring. But where do you stop? Why do we need to make things fair (or even, I hate seeing qb14 in the top 32 in scoring)? I was chatting with one of my co-commish about points for penalties drawn. Under your rule, would the wr who draws a P.I. penalty on a play and therefore a first down also get the points? Should we also propose the ability to sub out an injured player at half time for another player off my bench (obviously only 2nd half points would count). I think something (much more than an owners fustration) is lost in our struggle to make the perfectly fair game. I really don’t understand how first down scoring would require multiple other scoring changes. I feel a little bit like there is a straw man argument going on here. You could easily do the first down change without any others. However, since you brought up PI penalties, that is also on my list as a rule to consider if your league management system supports it (MFL does not). I wouldn’t do it as the same as receiving yards, but maybe at half the normal rate. If you are a 1 point for 10 yards, a 20 yard pass interference call could be worth a point. There are definitely some arguments to support that. You present a compelling case. Thank you, Jacob! How would this have affected RB and WR scoring in 2018? Or, put another way, what players would have benefited in 2018 from this scoring, and what players would have lost out? And by how much? I’m with Mushie on this one, how would the end of season stat lines be affected by this change? It really depends on how you structure it. If all you do is add in 1st down scoring, then it just adds 3-4 points per game to the top RBs and WRs. That is part of why I like balancing it with the slight decrease in PPR points. Regardless, it does make a few players a bit more viable as starters. Guys like Boyd, Godwin, Jeffery, Corey Davis, Mike Williams, and Sterling Shepherd were all players who had at least 60% of their catches go for first downs. They might not always have the big yardage or touchdown games, but their teams really counted on them to keep the chains moving. Starting them becomes a bit more attractive if you know they are going to get those opportunities. It also helps out more of the two down rushers. Guys like Peterson who don’t catch a lot of passes, but who do still grind out a lot of first downs. The one side effect of this is that it does give rushing quarterbacks a bit of a boost as well. Since the highly mobile quarterbacks typically rush when they have a chance to get a first down, they get a disproportionate amount of first downs. Allen and Jackson had 41 and 45 first downs on the season. Newton and Watson were 36 and 33 respectively. Ugh, those numbers didn’t space out very well.